One hundred and fifty boats are anchored on a lake right next to the Bypass and 228 shopkeepers are using them to sell their wares. One hundred and fifty boats are anchored on the floating market in Kolkata. Kolkata: West Bengal Chief Minister Mamata Banerjee's dream of changing Kolkata into London has taken a detour, it seems, via Bangkok. 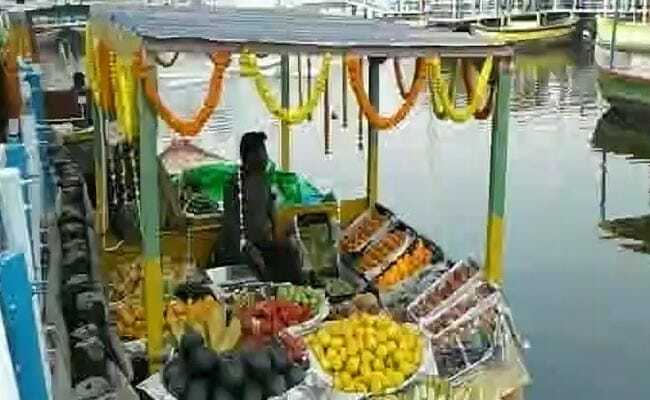 Like the one in Bangkok, Kolkata now has a floating market. The shopkeepers love it and are saying, why Bangkok, we could even be in Venice. "I have never been to Venice. But I have seen photos and it now feels like I am there. Mamata Banerjee has made it happen. This is the first such market in India. I am sure people will come to see it," said Kashinath Khobra, a vegetable seller at the market. Just off Eastern Metropolitan Bypass -- something like Delhi's Ring Road linking north to south -- the floating market at Patuli was inaugurated on 24th January. One hundred and fifty boats are anchored on a lake right next to the Bypass and 228 shopkeepers are using them to sell their wares. These shopkeepers used to set at a market nearby on terra firma but a major extension of Bypass displaced them. Faced with the rehabilitating these 228 people, Mamata Banerjee borrowed the idea from Bangkok and spent Rs 9 crore to set it up. Shibani Jana, a fish seller at the floating market, was excited about the unique marketplace but worried if her customers will still come to her at this new location. "I have had a shop on land for 30 years. Now I have stepped into water. Let us see what Mother Ganga does, whether she keeps us afloat or drowns us." The Kolkata Metropolitan Development Authority is in charge of the market. Urban development minister Firhad Hakim laughed off questions on the Bangkok detour and said, "Calcutta is better than London now. We are proud of our Eco Park, which is better than Hyde Park. We have Seven Wonders of the World here. We have wax museum here. So we will take all the things which are good."